Great Hotel! Beware of timeshare sales. My family and I were pleasantly surprised by by the overall appearance of this hotel. We booked on Costco.com with flight and breakfast $200 credit included. The 2 bedroom suite with full kitchen and an amazing view. When we arrived at the airport there were timeshare people waiting to make their pitch. Apparently they pay someone at the airport to have access to the passengers arriving before they leave the airport. I was willing to put my family through a pitch for 2 messages and 5 tickets to a water park. Yes I gave them $20 which was refunded after the presentation. I had heard That some people gave them as much as $200. After we got out of the airport the transportation people asked us if we gave any money to the timeshare crooks. What was very deceiving was that they were wearing Grarza Blanka shirts so I assumed that they were there to welcome us and take us to the Hotel. Not at all the case. They were their to sign us up for the times share breakfast which was not really free since our breakfast was already included and the presentation took 3 times longer than I had anticipated. One morning lost and three grumpy kids later we were finally able to enjoy this five star resort with two pools and a nice beach. This was a very nice experience. We still ended up spending a decent...My family and I were pleasantly surprised by by the overall appearance of this hotel. We booked on Costco.com with flight and breakfast $200 credit included. The 2 bedroom suite with full kitchen and an amazing view. When we arrived at the airport there were timeshare people waiting to make their pitch. Apparently they pay someone at the airport to have access to the passengers arriving before they leave the airport. I was willing to put my family through a pitch for 2 messages and 5 tickets to a water park. Yes I gave them $20 which was refunded after the presentation. I had heard That some people gave them as much as $200. After we got out of the airport the transportation people asked us if we gave any money to the timeshare crooks. What was very deceiving was that they were wearing Grarza Blanka shirts so I assumed that they were there to welcome us and take us to the Hotel. Not at all the case. They were their to sign us up for the times share breakfast which was not really free since our breakfast was already included and the presentation took 3 times longer than I had anticipated. One morning lost and three grumpy kids later we were finally able to enjoy this five star resort with two pools and a nice beach. This was a very nice experience. We still ended up spending a decent amount on drinks and lunch by the pool. Unfortunately the closest store is back in town about 25 min away. If you do not have the all inclusive then I would recommend paying the driver $25 bucks to make a detour to Walmart. They have groceries and most anything else that you may have forgotten. My wife even picked up mosquito spray bathing suits and sun block. And I picked my favorite beer. Bohemia :). Wish we had not waited until halfway through the trip to go to Walmart. 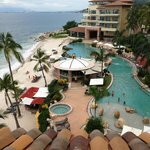 We meet in Puerto Vallarta since it is a middle point to all our family, for some reason we end up in Garza Blanca and I have the best time. The hotel is beautiful, right there in the the middle of the jungle and the beach. Far from the noise and crowded Nuevo Vallarta. 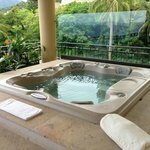 We went 6 adults and 2 kids, so we got the master suite, 3 rooms large closets and bathroom ammenities, 1 large kitchen, 4 TV with cable, 2 bathtubs, 2 amacas and 1 jacuzzi overseen the beach and hotel pool. I was concern with the all inclusive food package we got since in Cancun and Mazatlan I have the experience that the good meats, shrimps and drinks were not included. In Garza Blanca I was amazed they have 3 full serving restaurants The Bocados, Blanca Blue, Aquaazul with all the good expensive food and drinks included. The Blanca Blue is right next to the beach, behind the hotel reception, very nice view and excellent gourmet food pastas, ceviches, salads. The Aquaazul is where I eat the most since it is between the beach and the pools. They carried all the hamburgers, burritos, chiken nuggets, ceviches lots and lots of alcohol. My favorites the shimp burrito and the hamburger with like 200 grs of meat! As soon as you checkin into the hotel, there is no lobby line, they seat you in a wonderful chairs they give you a pepino martini and explain you everything about the hotel. If you take the all inclusive everything is free, food, drinks, kayaks, playballs, palapas only the gasoline motors are 50% off like jetskys. Everybody in this hotel is very friendly and helpful, from the gardeners, to the cleaning ladies, to the waiters and desk hostest but I like to say a special thanks to all the the guys in the Aquaazul that for 10 days give me the best service from 10 am to 11 pm: Supervisor Rene, Bartenders Noe and Leonardo, waiters Gonzalo, Jaime and very special to Ezequiel and Alvaro, these guys memorize what I like and wan and keep serving me with drinks and food every 10 minutes. One day I stay in the pool all day so they served me 40 whiskies until they ran out of my brand, so they ran to the other restaurant to get my brand and give me the whole bottle. I miss you guys! For what we eat and drink with my family pretty the room was free. Excellent all inclusive food and drinks, best I have ever seen. The owners spare no expense to build this hotel and rooms have the top of the line jacuzzies that are 24hrs heated, floors, beds, AC, TV, even the toilet paper is the good one! So yes, if you go to Puerto Vallarta this is by far the best alternative. I will definetly go back at least twice a year. One last comment, some company is doing the time sharing, just stay away and you be fine. They all threat you their best even if you do not attend. Wine for all inclusive is decent at best. There are 4 options for Red Wine and I believe 4 for White Wine. I Googled their Pinot Noir and online states it’s the “affordable Pinot Noir”. It’s a $13-14/bottle and they sell it for $14/glass. When on all-inclusive this is obviously free, but none of their other wine is available to you without purchase. The Cabernet was the best that they have, for my taste. For high end liquor on all inclusive, Ciroc Vodka is not included. Blanca Blue: We did not like this restaurant. I rate it a 5/10. The service was poor. Very nice young men trying, but they obviously have NO training in how to service a 5-star restaurant/hotel. We waited for water, bread, ordering, etc. The food was “fine”. I ordered seared tuna and my husband ordered pork roast. He said it was average. We ordered for desert the sorbet (for me) and the chocolate cake (for him). The sorbet was terrible - we took one bite. The chocolate cake was hands down the worst dessert we’ve ever tried. It had sweet potato ice cream (weird) and it was a rubbery brown thing. It seemed like they put it in the microwave. We didn’t eat that either… They had a Cuban band playing in the middle of dinner. There were three tables, including ours and we weren’t able to talk. Needless to say, we never went back to that restaurant. The servers need a ton of training, the managers need to be around to make sure that things are running smoothly. We enjoyed this restaurant more than Blanca Blue. The Filet Mingon was HUGE. The appetizers were pretty good. The view is amazing. The servers are it or miss. Last night we had the BEST server ever - he treated us like we were at a 5-Star Restaurant. However for breakfast, the servers were bad. They forget a lot of things. (I ordered an egg white omelet no cheese and of course it came with cheese). It takes about 5 minutes to get a cup of coffee for breakfast when you sit down. I’ve tried a few of their ceviches, and I would give them a 3/10. Not good. I’m from San Diego and I’ve had good ceviche… this stuff isn’t good. Shrimp caesar salad wasn’t great either. My husband did like his pizza…. but who can go wrong with a pizza :) The chicken is very oily. Decent Coffee. They have Soy Milk, so I was pleased with that. Standard room service food. We booked the Honeymoon Suite for our 1 Year Anniversary Trip. How could you go wrong with that, right?! It had a jacuzzi and hammock and table outside to relax with an ocean front view. AND…. when we checked in we also had a view of the awesome ROAD!! And Construction!! And wire polls. Wow, needless to say I let them know immediately that I didn’t want to hear traffic and sit in a jacuzzi over looking a road. I was told most people love the corner room because it has a better view. Yeah, I came to get away from traffic not listen to it. They did upgrade us (no fee) to the 1 bedroom suite with no road view. They are at 37% occupancy, so that was easy to do. The 1 bedroom suite is very nice. No jacuzzi, but huge patio with hammock, great accommodations, laundry, full kitchen, huge bathroom, 2 tv’s, etc. We were very satisfied with this room. As I mentioned the waiters need serious training if they are going to consider this place 5 Star. (There was one waiter that was Outstanding, but everyone else needs training) But besides the waiters/waitresses, I was pleased with the service. Argie (her nick name) was our concierge for the trip, and she was fabulous. The bell guys at the front were cool too. A lot of the employees talk up the Hotel and say how awesome the owner/developer “Mr. Corona” is and how much he cares. Well, if you have to talk everything up, you’re probably not that good. You don’t go to the Four Seasons and here the managers tell you how amazing they are and how celebrities vacation with them. They are amazing without bragging. That’s why I know they are struggling to get this place off the ground. They also charge for internet. Not expensive, but still. It doesn’t come in with all inclusive (internet). I liked the pools. Very relaxing, good temperature. The beach is nice but small. The water temp is great. Breakfast at the top restaurant (up in the tower) was good. They have all different “juicing” drinks. I eat very healthy and there were options for me… very good egg white omelet...not oily like most places. It’s secluded and you’re in the jungle. Very pretty, hotel is new and clean. All in all, we paid a lot for this trip and that’s why I’m picky. I enjoyed it, but I’ve enjoyed my stays at other hotels much better. This could be a great resort in the future. The new towers being built are beautiful with breath taking views. The town is not far away, $100 pesos. I also didn’t realize that we came in the slow season. There are very few of us staying here which is nice. It rained daily during our trip, but we actually enjoyed the rain and even sat outside for dinner in the rain a few times. Room tip: Do not book the end unit Honeymoon Suite - The Jacuzzi sits on the ROAD and overlooks utility polls. Other than that room, they are all beautiful and have an ocean view. I would book on a higher floor for best views. First of all, do the All Inclusive. It’s completely worth it. You are a taxi ride away from any restaurant, so do the math but the AI was well worth it. Secondly, do NOT, I repeat do NOT do the Timeshare presentation. We did not; we booked everything in advance and just said no thank you during the check-in. We were left alone for the remainder of our stay. We spoke with over 10 different couples/families regarding the Timeshare preso, the net was most were very annoyed by the presentation only 1 couple was able to simply listen and say “no” and collect their discounts. So again, just say no unless you want to ruin part of your stay. Third, befriend the Pool Bar and Activity staff. Fourth, if you eat at the Blanca Blue don’t be afraid to complain about bad service. The service is inconsistent breakfast/dinner. The Pool Bar Aquazul is the best place to eat. Eat there as much as possible. The food is the best, its simple, good portions (except the Chip/Dip small portion). Strangely there is no drink menu at the pool bar so be prepared to give them ideas along with the recipes if you must. Rafael the manager is working on a drink menu but please be patient and give them some good ideas. Gonzalo, Jamie, Rene, Alejandro, Martin, Alvaro, Ezequiel, Rafael and the entire Aquazul staff (cooks/bar) are the best, just the absolute best. They will make stuff off the menu for you. The Activities Staff; Omar, Genaro, Francisco, and Alan are just superb. They want you to have fun. Go on the hike, but go during the weekday if you can. You will have the time of your life. Please be respectful of the hotel equipment; boogie boards, kayaks, SUPs, and snorkel gear isn’t cheap. We as guests pay indirectly for it; I saw many guests misuse the equipment and it really upset me because it literally broke and they had to get more boogie boards the next day. The hotel room itself; we had a 1 bedroom on the first floor (3101-A). It was awesome, except for the bed and sofa bed. The bed itself was too hard and the sheets were rough. The sofa bed was a joke. We asked for a rollaway, Cecila front desk, was great and arranged it. They made super comfy for my daughter. Our bed, well they tried but it was just too hard and the sheets…uuggh…they were just rough. The BocaDos STK, you have to go and enjoy the view. We had beautiful thunderstorms every night. To watch them roll in was such a treat. BTW we knew that August was the rainy months so we were all set for the t-storms. We stuck with the filets as they were just melt-in-your-mouth. The Blanca Blue. This is for the hotel ownership and management. Let me preface that I’ve worked in hotels at all levels of service and quality and specifically (2) 5 star/5 diamond hotels and I also opened/trained staff at 2 other 5 star/diamond hotels, which is rare, very rare. I’m Ritz Carlton/Horst Schulze and Peninsula Hotel/Michael Kadoorie trained. What makes a hotel a true 5 star/diamond is anticipating guest requests, meaning you maintain a hotel at the highest level so that the guest never requests anything that can’t be addressed with on-site services/staff/resources. And most importantly, the level of service is unquestioned. With that hotel employees are to never dine in uniform, on duty during peak hours. I don’t care if this guy with the glasses and the grey hair is the GM, he should not be taking away resources from the hotel guests. Each and every morning, there he was dining taking away resources from the paying guests. Very, very disappointing. You should be ashamed of yourself. We paid $500 a night and we never had a decent breakfast because of you. All the restaurant staff fawned over you, why? Are you an appointed Saint? That said, Garza Blanca misses this point big time with the Blanca Blue. Our breakfasts were challenging and disappointing. The 2 dinners we had there were just ok. So since we were AI how do you resolve this? TripAdvisor and a letter to the ownership group. 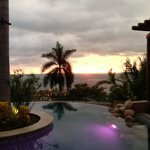 Our family of 6 just returned from a week at Garza Blanca. Overall it was a great experience and everyone (including all 4 children) had fun - which is no small feat! Our visit started out well when we arrived. My wife had hurt her foot and she told the staff that she wasn't sure how well she could handle the walk to and from the towers where they had us booked. The towers are across the road from the main complex and you have to walk some distance to get to the pool and beach area. The staff immediately changed our room to one in the building next to the pool, on the first floor, about 50 feet from the pool. The space was literally huge and extremely well appointed. Polished stone floors, extremely clean, 2 large bedrooms, 2 full baths, 1 partial bath, full kitchen, eating area, 3 flat screen TVs, and great air conditioning (which you need given the heat this time of year). Further, the maid (who must have spent almost an hour cleaning every day) kept the entire room clean and organized every day. In the interest of brevity, I'll focus the rest of my review on the plusses and the minuses. - The facilities are top-notch for the PV area. The pools are nice, relatively large, clean and refreshing. The rooms (as I note above) are fantastic. - The beach is probably 800-1000 feet long (the coast is rocky and I think the hotel may have cleared an area and brought in sand) but very functional for swimming (they also have an area roped off for swimmers), snorkeling (which is very good), kayaking, paddle boarding, and just floating. There is no boogey boarding to speak of on this side of the bay; the waves just come in and break next to the shore. But, the rest of what you can do more than compensates. Also, this was by-far the warmest ocean water I've ever been in. It's literally close to bath water, and completely insufficient when taking a dip to cool off from the heat. If you want to cool off, you have to go to one of the pools. The hotel also provides umbrellas, lounge chairs, and a dining area where there is full service from the outside restaurant and bar. - The hotel provides quite a bit of sports equipment at the beach to people who chose the all inclusive package (we did). This includes snorkeling equipment, boogey boards, paddle boards, kayaks, life jackets, volley ball equipment, and probably more that I didn't see. The beach attendants also arranged rentals for us from some men who came up to the beach with jet skis (who they obviously knew ;-) ). The price was $120/hour which really surprised me. I know that's not chump change, but I've never seen jet skis for less than $200+ per hour. We rented one for one hour, and they helped us switch around the kids and drivers so we all got to ride. Afterwards, the jet ski guys introduced us to another man who has a boat set up for sport fishing in the Bay of Bandaras (who had just driven up to the shore). The hotel had negotiated a price of $60/hour for a boat with 2 motors, captain & mate, 6 rods, and all of the bait. We arranged for a 4 hour trip the next morning, paid a $60 deposit, the guys showed up on time the next day, and we caught some fish that almost pulled us into the water. We brought 1 of the 3 fish back to the hotel, and the chef cooked it for us that evening! - The staff is extremely attentive, helpful, friendly, and very happy to help you polish up your Spanish skills (but only if you ask). There are plenty of waiters at the pool, someone was always stopping by your chair to ask if you needed anything, and it was easy to feel very well taken care of. I'll add that the staff seemed to be truly interested in making sure you were having a great time, and were happy when you said you were. We were never asked for a tip or felt like anyone was being nice only to get one. - The all inclusive package was truly all inclusive (except, curiously for the rack of lamb, which was $32 extra). The package included all of the food at the pool (a separate restaurant from the dining-centric main restaurants), the main restaurants, and *room service*. Our kids were out of their minds with joy from being able to order their own breakfasts from room service each morning - and there were no extra charges. By the way, the drinks might have been a little watered down - but only because the ice melts so quickly in the heat. - It was hot, hot, hot. Some love it, some don't. My family loves it; I don't. So, I hung out at the pool and read a book, and jumped in the pool to cool off. Some snorkeling. But, that's about as much as I wanted to do between about 11:00AM and 5:00PM because it was that hot. - It rained virtually every day. BUT! Only after about 5:00PM. The days were beautiful, and the heat built up large clouds that usually turned into thunderstorms by about 6:00PM. For us, they didn't get in the way at all. In fact, the lightening and thunder was kind of fun to watch from our porch. So, don't stay away from PV this time of year because you have been told that it's the rainy season. - There are 2 restaurants that serve dinner. One (the Blanca Blue) is in the main area and is fairly good. The other is a 'steak and small bites' restaurant (I don't recall the name) in one of the towers on the other side of the complex. Our meal at the steak/bites place was just weird. It's hard to describe why. The meat - grilled very prominently - weren't as good as at Blanca Blue, and the small bites were odd. My wife and I paid extra for the aged beef options, and the were also not nearly as good as at the other restaurant. Desert was disappointing. And, the service was painfully slow. Dinner there was clearly the low point of our stay. But, you can choose where you want to eat, and we only chose to eat there once. That's about it! All in all, I think these guys did a great job, and we would definitely go back. The Service, the View, Relaxation perfected ! After booking a great rate on-line , my wife and were very happy to check in to Garza Blanca and were so impressed by the beautiful indoor-outdoor lobby and the great service upon our arrival. Security is tight , so you do have to go through a gate and guard each time you come in , but not a problem. Our room in the tower was amazing with an 180 view of the bay and giant soaking tub and shower, both with a view of the bay as well. Service was always just minutes away and the food both poolside and at the restaurants was top notch even if the drinks were a little watered down. The only downside of the amazing place is their push upon check- in to get you to go to the breakfast sales presentation. If you can manage to skip that , your stay will be heavenly.